TAP TAKEOVER WEEKEND FEATURING THREE BEER LAUNCHES! To conclude our Tiny Rebel July Residency in style we’re having a huge weekend of Wale’s finest export since Gareth Bale. We will be hosting beer launches each day of the weekend as well as having a plethora of TR beers on the taps. Imagine Imperial Puft with shed loads of chocolate. If you can’t picture that, think about Chocolate Stay Puft, but an imperial version. Tasting notes – boozy Stay Puft with Chocolate! Imperial? Check. Marshmellow? Check Chocolate? Check. Job done. We’ve been fans of Northern Monk for a while and we’re chuffed to say we’ve done a collab with them! We love big fruity NEIPAs but everyone’s done a big tropical murk monster, so we started to think in other places. The idea of stawberries cropped up, and then cream was suggested to go with the silky texture of the style. Whack a load of lactose in and what do you get? Fields Forever! Loads of late and dry hopping for bags of aroma and flavour with low bitterness, then the strawberries, vanilla and lactose do the rest! Two of the UKs best breweries pushing boundaries! Whats not to love? Part of our single-hopped milkshake IPA series but this one ISN’T single hopped! Ok, well it is, but that’s not the main feature of this beer! Instead of mountains of dry hop we’ve chucked in a few hundred punnets worth of fresh strawberries! The aroma is, as expected, rich with strawberry, with a nice malted undertone. Flavour is very much the same, but rather than sweetened, candy-like fruit flavour, it’s a really fresh, slightly tangy note that really takes you out into the fields for a bit of fruit picking. The lactose smooths it all out and gives it a bit of sweetness to round off the edges. It’s delicious! Get your Camra pants on and come taste the future! Lychee Lager 4.2% The floral fruity sweetness of lychee is a perfect accompaniment to the sweet maltiness of a lager, so we’ve gone and done what seems very sensible – and we were right! Cwtch 4.6% Probably the best word ever. Cwtch rhymes with butch and can mean either cuddle or cubbyhole. Grab a glass, relax and cwtch up with this untraditional Welsh red ale – a perfect blend of six caramelly malts and three citrussy American hops. Citra Milkshake IPA 4.2% TR brewed up a single-hop IPA with one of their favourite hops, Citra, and have drawn out the flavours with a little bit of sweetness. The Great Cornholio 8.4% Double Rye IPA with a really full-bodied, thick double IPA, backed full of really multi-dimensional hops. Mosaic and Chinook combine with a pair of South Pacific varieties for a layered amalgamation of citrus, pine and spice. Cheeky V 4% Vimmie Sour with punnets and punnets of raspberries, blackcurrants and grapes go into this super delicious kettle sour. Clwb Tropicana 5.5% This grown up fruit salad is as colourful as the most hideous Hawaiian shirt you’ve ever seen. It’s super juicy and crammed full of fruity hop flavours that will have your mouth watering. Imagine sitting by the pool in the blazing sun with a cocktail in one hand, but instead of a dainty little glass it’s served by the pint! Cherry Bomb 5% Explosively sour, Cherry Bomb is packed full of sweet cherries that round off this modern take on a kriek. The sourness detonates on your tongue in an explosion barely contained by your cheeks, before the rich flavour of cherry kicks in as the dust settles. Fugg Life 4.2% Our Brit PA is wholly hopped using British hops. Rather than the fruity, citrussy flavours imparted by American and Pacific hops we use their British cousins resulting in an earthy, woody flavour that makes for perfect bittering. Nelson Sauvin Milkshake 4.2% The third instalment of our single-hopped Milkshake series! This time we supercharge New Zealand’s fruity, musky Nelson Sauvin with lactose! 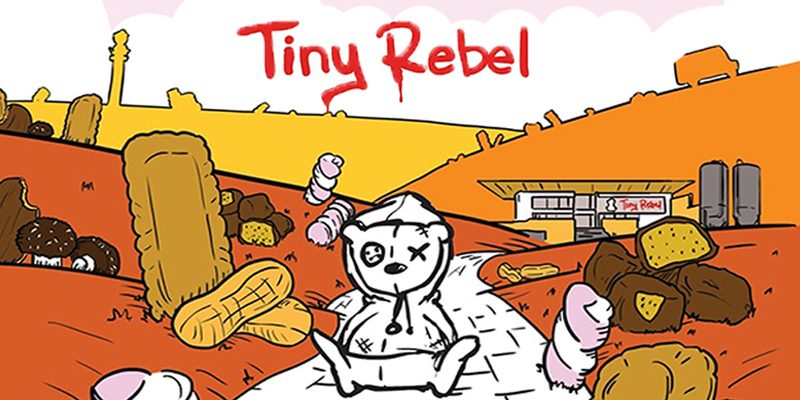 Check out www.beermerchants.com for more Tiny Rebel goodness delivered straight to your door!